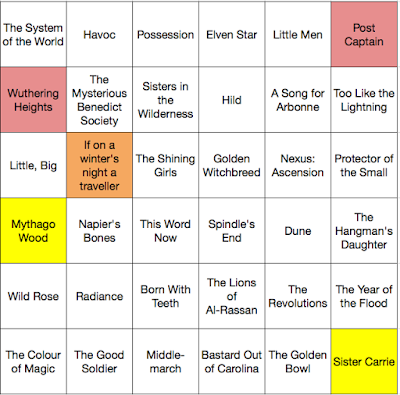 Sooo I haven't made great progress with my TBR Bingo card yet this year. In fact I don't think you'd be off base if you called my progress to date downright scanty. Book club! I've read two book club books so far this year. Both have been short, but any book that isn't on the bingo card basically gets in the way of my reading a book that is. At the moment, I'm doing my best to read both Titus Alone and Gormenghast by Mervyn Peake, also for book club, and that represents over seven hundred pages worth of reading that aren't on the bingo card. Long books! See my previous comment about reading the first two books in the Gormenghast trilogy, as well as the further considerations that (1) Sister Carrie was nearly 500 pages long, (2) The Golden Bowl is even longer and also it's by Henry James so it isn't exactly a light romp, and (3) I also decided that now would be a good time to read The System of the World so that when I visit my sister in May, I can bring it back to her. I really do hope to read more of the bingo card books next quarter, but it's not as though there are fewer book club books or long books on the horizon (actually when it comes to long books, at least long books on The List, after The Golden Bowl I'll be set until the next Henry James book). I do have a vacation coming up, though, which generally means that I do a ton of reading. Plus summertime reading! Woo! In case you are wondering, the colours indicate which month I finished the book in, with red being January, orange being February, etc. I'll cross the bridge of what to do when I run out of colours of the rainbow sometime this summer. Tweet Me | Tumbl Me | RSS me | I am a participant in the Amazon Associates Program, an affiliate advertising program designed to provide a means for me to earn fees by linking to Amazon and affiliated sites.